Vander Joaquim scored 23 points and grabbed 12 rebounds Saturday night as Hawai’i held off Fresno State, 62-58, in Western Athletic Conference men’s basketball action at the Stan Sheriff Center. 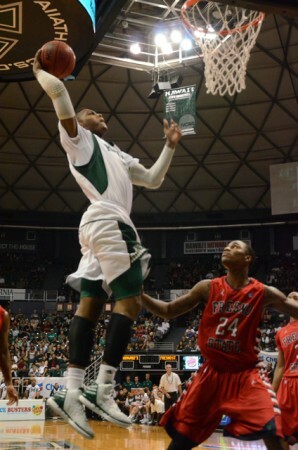 The Warriors improved to 14-10 overall, and remained in fourth place in the WAC at 6-4. The Bulldogs fell to 11-16, 3-8. Hauns Brereton added 12 points and five rebounds and Joston Thomas finished with 11 points. Jerry Brown III led Fresno State with 17 points and Tyler Johnson added 10 points. UH jumped out to a 12-1 lead in the first seven minutes but Fresno State briefly took the lead at 37-35 on Brown’s layup with 15:53 remaining in the game. The Warriors then answered with a 10-0 run capped by Brereton’s jumper that made it 45-37 with 12:22 left. The Bulldogs later closed it to 58-56 after Johnson’s two free throws with 4:03 remaining, but Thomas sank two free throws at the 3-minute mark and Zane Johnson dropped a 15-foot jumper with 34 seconds left to make it 62-56. After Tyler Johnson’s free throws cut it to 62-58 with 12.5 ticks on the clock, Fresno State missed a 3-point attempt with six seconds showing and then a desperation 3 at the buzzer. It was a good game, but I still saw too many reboundable balls dropping to the floor in front of our players. Rebounds are supposed to happen up above the head. Miah had some sick dishes. Bobby had one too. Not the greatest game by the Bows but, after the Nevada game, I’m sure most of us will take it..
What’s up with Shaq, though.. He’s practically at the end of the bench in terms of playing time.. Even Bobby Miles is ahead of him.. It’s gotta be killing him.. I just don’t see him coming back next year..